Click here for Part 1 of this series and links to the other articles. Like any book, the Book of Mormon has a history. This article traces its modern history from Joseph’s accounts of discovering the gold plates from which the Book of Mormon is said to have been translated to the most recent editions of Joseph’s translation. The history of the publication of the Book of Mormon is complex and extremely controversial (see Table 3 below for a chronology). According to Joseph Smith, an angel (whom he later identified as Moroni) appeared to him repeatedly between September 1823 and September 1827 to show him the gold plates and related materials buried in a stone box in a hill near Joseph’s home in Palmyra, New York. This span of four years between initial contact and Joseph’s coming into possession of the plates is probably related in some way to the fact that during part of those years Joseph was engaged in “money-digging” or treasure-hunting, a widespread if somewhat disreputable activity in his day. According to the traditional account (see Joseph Smith—History [JS-H] 1:27-59), on September 22, 1827, Moroni allowed Joseph to take custody of the plates, along with an apparatus for translating the plates called the interpreters (and later, after the publication of the Book of Mormon, often called the Urim and Thummim). For about two months that spring of 1828, Joseph dictated a translation from the gold plates to Martin, with a curtain shielding him so that Martin could not see Joseph or the plates. Indeed, by all accounts, Joseph allowed no one to examine or even see the gold plates for nearly two years after he acquired them. The two men produced a reported 116 pages of handwritten manuscript even as Martin’s wife Lucy, who was understandably skeptical of the project, repeatedly demanded to see the plates or at least the manuscript. After several denials of these requests, on June 14 Joseph said that God had given permission for Martin to take the manuscript pages home with strict instructions to show them only to his wife and four other close relatives. Martin showed the pages not only to his family but to a number of friends, keeping them in a locked drawer at home. Within two weeks someone broke into the drawer and stole the pages; they were never recovered and the thief never identified. A common theory is that Lucy herself took the manuscript and destroyed it, which would explain why it has never resurfaced. On September 22, 1828, one year after Joseph said that Moroni had originally turned the plates over to him, Joseph reported that they had again been entrusted to him to translate. Over the next six months Joseph dictated translation of the plates occasionally to his wife Emma, though how much is unknown. In March 1829, Joseph issued another revelation announcing that three men would be permitted to be witnesses to the gold plates and that Martin Harris might be one of them if he repented (D&C 5). On April 7, Joseph began dictating anew with Oliver Cowdery, a schoolteacher and new friend (see JS-H 1:66-67; D&C 6, 8, 9). Although no record of each day’s work was kept, what references exist to the contents of the translation on various days has led to general agreement among both LDS and non-LDS researchers as to the order of translation. It appears that Joseph began the dictation about where the narrative of the 116 pages had left off, dictated Mosiah through Moroni, and then dictated 1 Nephi through Words of Mormon.3 One possible reason for this unusual order was to allow more time to pass in case the lost 116 pages turned up after all. This description of the dictation process suggests a number of difficult questions. On the one hand, the use of the seer stone in the hat would seem rather clearly to preclude the use of written or printed sources (such as a Bible) during the dictation sessions. On the other hand, this process implies that Joseph’s dictation was essentially no more than a repetition of whatever words were supernaturally made to appear before him in the dark of his hat. If this implication is correct, then Joseph’s translation of the Book of Mormon should not be dependent on modern sources for its specific wording—yet much of the Book of Mormon repeats verbatim or nearly so the wording of many passages in the King James Version of the Bible. These and similar questions have made the whole issue of the translation “method” of the Book of Mormon something of a quagmire in Mormon intellectual circles. Some LDS scholars defend a relatively “tight control” model of translation in which Joseph’s dictation closely and literally translated the ancient text on the gold plates, so that the resulting English text reflects very little if any of Joseph’s own mind or knowledge (and leaves comparatively little room for errors). Others defend a looser model in which Joseph had to study or think through each part of the text before giving his dictation, so that the resulting English translation reflects in varying degrees significant elements of Joseph’s own knowledge (and so has more potential for errors). A few Mormon scholars have even suggested that Joseph made substantial use of the King James Version and his own knowledge to expand or interpret the ancient Book of Mormon text. Joseph and Oliver’s work on the translation proceeded at a much more rapid pace than had been the case a year earlier with Martin Harris. In less than three months (April 7 through late June) they apparently produced a handwritten manuscript for the entire Book of Mormon. The qualification apparently is justifiable because again no daily record was kept of the progress on the manuscript and we know that Joseph had dictated at least some pages to Emma earlier. He may also have spent those nine months from July 1828 to March 1829 working out a plan or story line for the book. Mormon apologists commonly argue that the extreme rapidity of the dictation (equivalent to six to eight pages of the modern printed edition a day) makes any naturalistic theory of the book’s origin implausible.5 From an outsider’s point of view, on the other hand, the fact that Joseph was able to generate text about three times faster with Cowdery than with Harris suggests that Cowdery, an educated man, had a more active role in the work than the men testified. The generally unchallenged yet gratuitous assumption is that all of the pages of the manuscript were actually produced during the dictation sessions that Joseph’s family and friends witnessed. In June 1829, as the work of translation neared completion, Joseph arranged for select witnesses to view the gold plates (see D&C 17). Harris, Cowdery, and David Whitmer (in whose home Joseph stayed during much of the translation work) reported that Joseph took them to a secluded location in the woods, where after some intense prayer they were permitted to see the angel (Moroni), who showed them the plates. (Harris, though, reported having his vision of the angel and plates separately from the other two.) “The Testimony of Three Witnesses,” printed in the front matter to the Book of Mormon, is vague as to the nature of this experience, and some evidence (including some later accounts) suggests that the experience may have been visionary rather than physical. Joseph also showed the gold plates (this time without the angel) to eight other men, whose “Testimony of Eight Witnesses” emphatically affirms that they examined and even held the plates to verify their physical reality. All eight of these witnesses were members of the Smith and Whitmer families: David’s brothers Christian, Jacob, Peter, and John Whitmer, their brother-in-law Hiram Page, and Joseph’s father Joseph Smith Sr. and brothers Hyrum and Samuel. The evidential value of the eleven witnesses has been a contentious issue ever since the Book of Mormon was published. Once the translation work was complete, Joseph reported, Moroni took the gold plates back into his custody. It is therefore impossible for anyone to examine the plates or to decipher whatever text, if any, may have been written on them. Both the witnesses and Joseph himself later provided specific information about the physical dimensions of the gold plates. Some of the eight witnesses reported lifting the plates and estimated them to weigh a total of about fifty to sixty pounds. The flat surfaces of the plates measured about six by eight inches, and the entire collection measured about six inches high (that is, with the plates stacked together). These dimensions are inconsistent with the claim that the plates were composed of gold, since a stack of gold plates of that size should weigh close to two hundred pounds. Mormon apologists usually explain this discrepancy by arguing that the plates were only gold in color, not in composition. Even if the plates weighed only fifty or sixty pounds, however, the weight raises other difficulties. For example, most Mormon scholars argue that Mormon and Moroni lived in Central America and that Moroni walked from there to upstate New York where he buried the plates before his death. This means that Moroni would have walked some three thousand miles carrying fifty or sixty pounds of gold plates (along with whatever other supplies he might have possessed). Such a scenario seems highly implausible and even pointless, especially considering the fact that Joseph never actually looked at the gold plates while dictating his translation. The various issues just discussed lead to the question of the reality of the gold plates. On one side are Joseph’s secretiveness about the plates, the controversial elements of the testimonies of the eleven men who affirmed they had seen the plates, and the discrepancies concerning the plates’ dimensions, composition, contents, and language. These facts appear to support the view that Joseph did not actually have a set of ancient gold plates. On the other side are the testimonies of the eleven men, reports of the plates wrapped up and sitting on the table, and the reported subterfuges of Joseph to hide the plates from those who might try to steal them, all of which support the existence of the plates. Perhaps Joseph at some point did have metal plates of some sort, but they were not gold and were not ancient documents written with Egyptian characters. Such a conclusion probably fits the available facts and testimonies better than any other explanation. Once the translation was complete, Joseph had Oliver produce a second handwritten manuscript by copying the dictation manuscript. These two manuscripts of the Book of Mormon have become known as the Original (O) and the Printer’s (P) manuscripts. Only 28 percent of O (including most of 1 Nephi, much of Alma, and little else) is now extant, while P has survived essentially intact and is in the possession of the Community of Christ. The period of time during which Oliver produced the backup manuscript may have been an opportunity for the original to be corrected or even augmented. According to LDS scholars, about one-sixth of the first printed edition of the Book of Mormon actually followed O rather than P. A local printer, E. B. Grandin of Palmyra, New York, typeset and published the first edition of the Book of Mormon, released on March 26, 1830 with an initial printing of 5,000 copies. Eleven days later, Joseph Smith founded the Church of Christ (as he then called it) on April 6, 1830. Two major new editions of the Book of Mormon were published during Joseph Smith’s lifetime. The most significant of these was published in Kirtland, Ohio, in 1837. Hundreds of grammatical and spelling changes were made to the text as well as some theologically significant revisions. The most interesting of these changes was the revision of three references to Jesus that appeared in the first edition to identify him as God the Father. For example, “the mother of God” was changed to “the mother of the Son of God” (1 Nephi 11:18); “the Lamb of God, yea, even the Eternal Father” was changed to say “even the Son of the Eternal Father” (1 Nephi 11:21; see also 1 Nephi 11:32; 13:40). These changes are known departures from the original manuscript (O) as well as the 1830 edition. In 1840 Joseph published another edition with additional changes. While some of these changes represented corrections conforming the text to O, at least one famous change was a departure from it. In O as well as the 1830 and 1837 editions, 2 Nephi 30:6 said that a remnant of people descended from Lehi’s family would someday convert to faith in Christ would thereby become “a white and delightsome people.” The 1840 edition changed these words to “a pure and delightsome people.” Subsequent editions, however, reverted to “white” until the 1981 edition. 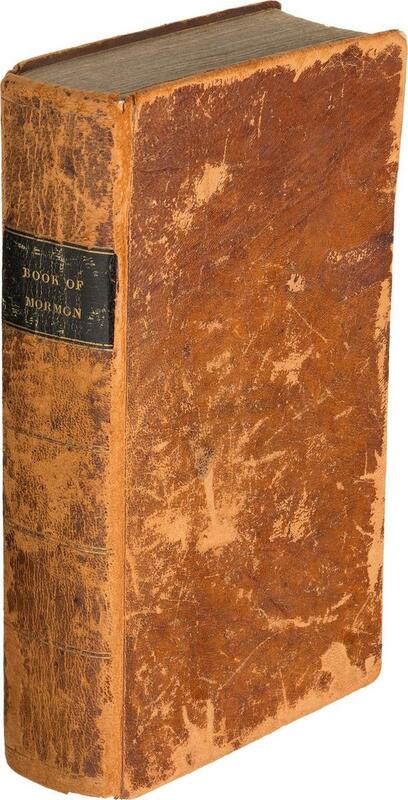 In 1879 the LDS Church published a new edition of the Book of Mormon edited by apostle Orson Pratt. This edition introduced the chapter and verse system still used today. Significant new editions were published in 1920, edited by James E. Talmage; in 1981, edited by a committee of LDS apostles led by Bruce R. McConkie; and in 2013. The Reorganized Church of Jesus Christ of Latter Day Saints, which arose in the 1850s among Mormons who did not follow Brigham Young to Utah, published its own editions of the Book of Mormon. Its main edition was published in 1908 and continued to serve as the official RLDS version of the Book of Mormon for the rest of the twentieth century. It follows a different chapter and verse system than the LDS Church’s editions. In the 1980s, Royal Skousen, an English language scholar at Brigham Young University (BYU), began work on a comprehensive study of the “textual criticism” of the Book of Mormon, reviewing the O and P manuscripts and the printed editions from Joseph Smith’s lifetime in an effort to establish a more correct Book of Mormon text. His Critical Text Project of the Book of Mormon, launched officially in 1988, produced published transcripts of O and P (2001), a massive six-volume Analysis of Textual Variants of the Book of Mormon (2004-2009; a second edition was published in 2017), and The Book of Mormon: The Earliest Text (2009). 1. See further Robert M. Bowman Jr., “Anthon Transcript: Did Charles Anthon Authenticate the Book of Mormon Characters or Translation?” (Cedar Springs, MI: Institute for Religious Research, 2016). 2. See further Robert M. Bowman Jr., “The Lost 116 Pages and the Book of Mormon” (Cedar Springs, MI: Institute for Religious Research, 2016). 3. The case has been most thoroughly presented in (non-LDS) Brent Lee Metcalfe, “The Priority of Mosiah: A Prelude to Book of Mormon Exegesis,” in New Approaches to the Book of Mormon: Explorations in Critical Methodology, ed. Brent Lee Metcalfe (Salt Lake City: Signature Books, 1993), 395-444. This “Mosiah first” theory is now widely accepted by LDS scholars. 4. See further Robert M. Bowman Jr., “Joseph Smith’s Seer Stone” (Cedar Springs, MI: Institute for Religious Research, 2015). 5. E.g., John W. Welch, “How Long Did It Take to Translate the Book of Mormon?” in Reexploring the Book of Mormon, edited by John W. Welch (Salt Lake City: Deseret; Provo: Foundation for Ancient Research and Mormon Studies, 1992), 1-5. 6. See Neal Rappleye, “Learning Lehi’s Language: Creating a Context for 1 Nephi 1:2,” Interpreter: A Journal of Mormon Scripture 16 (2015): 151–59. 7. See The Book of Mormon Study Text, edited by Robert M. Bowman Jr. (Cedar Springs, MI: Institute for Religious Research, 2017). Part 1 - What Is the Book of Mormon?